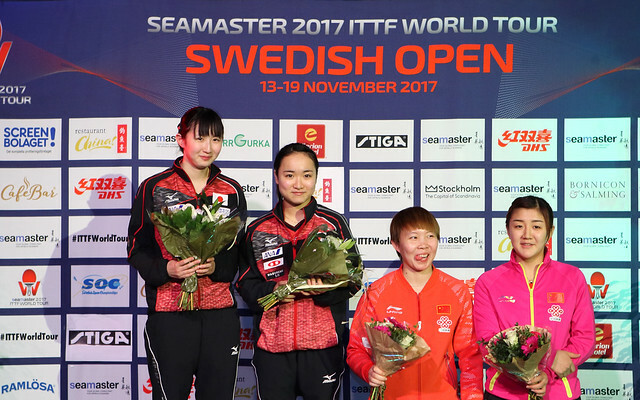 Impressive performances, China’s Zhou Yu and Fan Zhendong emerged successful at the quarter-final stage of the Men’s Singles event at the Seamaster 2017 ITTF World Tour Swedish Open in Stockholm on the late morning of Saturday 18th November. Required to compete in the three day qualification tournament, Zhou Yu accounted for colleague, Lin Gaoyuan, the no.4 seed (7-11, 6-11, 13-11, 11-3, 16-14, 11-6); Fan Zhendong, the top seed, ended the hopes of Nigeria’s Quadri Aruna, also a qualifier (11-6, 11-8, 12-10, 11-5). Present in the Eriksdalshallen an hour before the start of play, practising together, it was Lin Gaoyuan who made the better start in his contest against Zhou Yu; he was the quicker to seize the opportunity the more active player. In the opening game he went ahead 5-1, he never extended the lead but more importantly from his point of view he never relinquished the advantage. The second game very much followed the pattern of the first; less than 15 minutes of place, Lin Guaoyuan held a two-nil lead. A good start for Lin Gaoyuan had been the scenario in each of the first two games and never look back; in the third it was Zhou Yu who made the better start but it was not a case of never look back. He went ahead 5-1 but the next three points went to Lin Gaoyuan. A one point difference, he called “Time Out”. Lin Gaoyuan levelled before establishing a 10-8 lead; Zhou Yu won the next two points and saved one more game point prior to securing the game at his first opportunity. Undoubtedly, the success gave Zhou Yu and injection of confidence; in quick-fire style he won the fourth as Lin Gaoyuan made a string of errors. Time to start again and life was just as in the opening game, Lin Gaoyuan made the better start. He led 7-4 before holding four game points at 10-6, the stage at which he experienced yet another “Lin Gaoyuan moment”. Just as against colleague Xu Xin at the Liebherr World Championships and more recently at the Liebherr Men’s World Cup against Germany’s Timo Boll, when holding some six match points and losing the lot to experience defeat. In Stockholm, he did the same; the only difference being they were game points, nor match points. He lost the next five points. Game points saved, game points spurned, at 14-13 another opportunity. He elected for “Time Out” but the promptly lost the next three point, serving off the end of the table on the deciding point. Playing a step back from the table in his trademark manner, as opposed the quicksilver Lin Guoyuan who plays much closer, in the sixth game Zhou Yu was never in doubt, a 10-5 lead, on the second match point he converted. “In the first two games, Lin Gaoyuan was too fast, I could not adjust to his speed. I focused on playing towards his backhand early in the rally, his forehand is so fast. Winning the fifth game was vital, it changed the match in my favour.” Zhou Yu. A good start for Lin Gaoyuan but then defeat, for Fan Zhendong it was a good start, he secured the opening game but never rule out Quadri Aruna. Fighting for every point the Nigerian established a 9-6 lead in the second game; Fan Zhendong reduced the arrears to 9-8, Quadri Aruna elected for “Time Out”. Fan Zhendong levelled. He saved one game point at 9-10, before winning three in a row to move into a three games to nil lead. The third game secured, a possible crisis averted, Fan Zhendong was brim full of confidence, he secured the fourth game in style, the match ending in exhibition mode.